I first made a version of this recipe about 15 years ago. I saw it in a magazine, fell in love with its honesty and simplicity and have been making it for my loved ones ever since. I’ve changed it up a bit since that first time all those years ago – although I suspect that it’s this rustic, almost ‘thrown-together’ quality that is part of its charm. 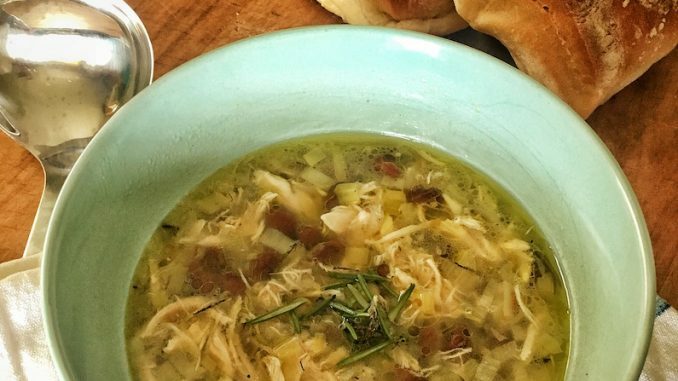 It’s perfect for these chilly winter nights and is wonderfully hearty when mopped up with some crusty Italian bread and fruity extra virgin olive oil. Poach the whole chicken breast in a saucepan of boiling water with a sprig of fresh rosemary until cooked through. Remove chicken from the pan and leave to cool, reserving the cooking water to add to your soup later. Once cooled, shred the chicken breast finely using your fingers to pull it apart into fine strings (do not use a knife for this as you will not get the right texture). Sauté the leek and garlic in a little olive oil until lightly golden. Stir in the red kidney beans, a handful of roughly chopped fresh rosemary, and season to taste. Add the chicken stock, reserved chicken cooking water, shredded chicken and cooked pasta, and simmer gently to infuse the flavours. Serve in large bowls with a good drizzle of extra virgin olive oil and some crusty Italian bread.